What do you get when you infuse a project with the organic, earthy tones of Vintaj’s hand-antiqued brass? An endless realm of possibility, because the beauty of Vintaj is now available at the Bead Bazaar! To celebrate our new collection, we are giving away a Vintaj piece with every $20 purchase! You get to choose from a specific selection of Vintaj charms; one per customer please. This special runs until April 18th or while supplies last, so don’t hesitate to take advantage of a free giveaway! Vintaj charms come in a variety of styles; historically inspired filigrees of the Victorian and Art Deco periods, edgy Steam-Punk images of keys and gears, and the natural beauty of birds and dragonflies. 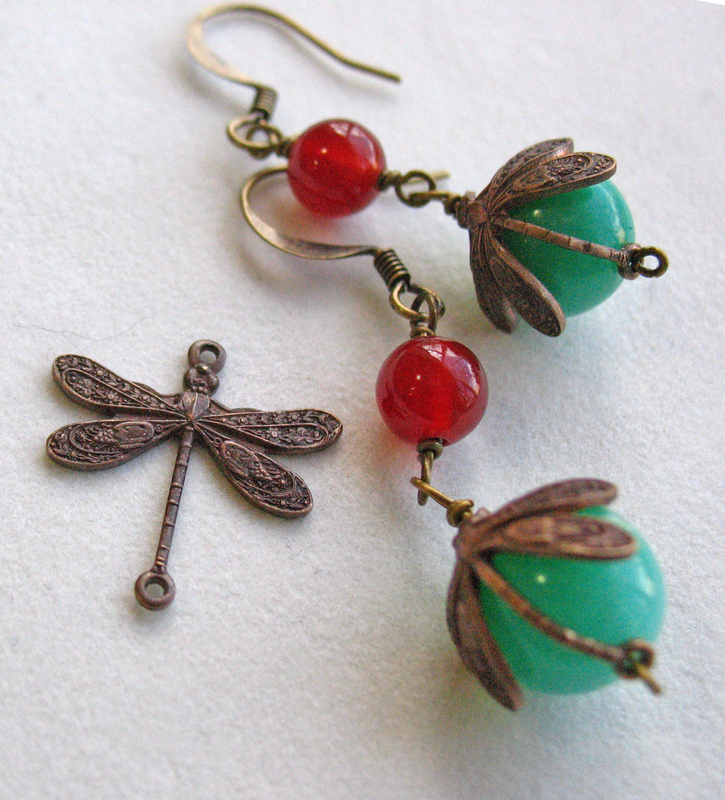 It’s rustic brown tones compliment many spring colors and give beading projects a warm glow. 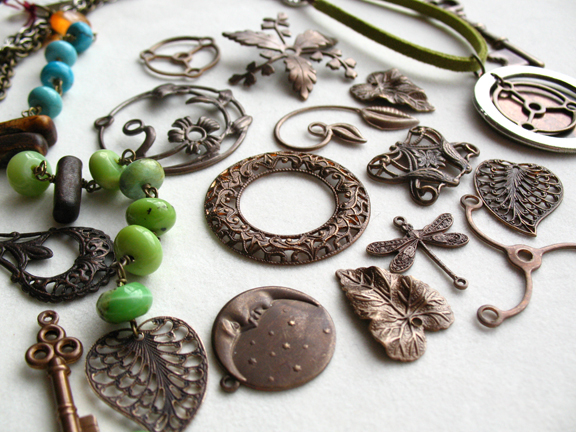 We also carry blank tags, pieces that can be hammered or stamped with your own individual designs. Whatever your style, the Vintaj is sure to please! With Saint Patrick’s Day soon upon us, we are showcasing lush green beads and Celtic designs. The green is a St. Patty’s day tradition, evoking images of Ireland, lovingly known as the Emerald Isle. The well known shamrocks are a symbol dating back to St. Patrick’s teachings about Christianity, linking the holy trinity to the three leaves of a clover. Ireland is supposed to have the most fairy activity in the world, so a fairy pendant is never ill-placed in showing Irish pride. Celtic knots also link back to Irish history, making them appropriate on the day dedicated to Ireland’s patron saint. Celtic (pronounced keltic, not seltic) knots were used in design as early as the 3rd and 4rth centuries AD, originally found in the artwork of the late Roman Empire. From there it spread as the empire did, through Italy, Gaul, and eventually the British Isles, settling in Ireland. 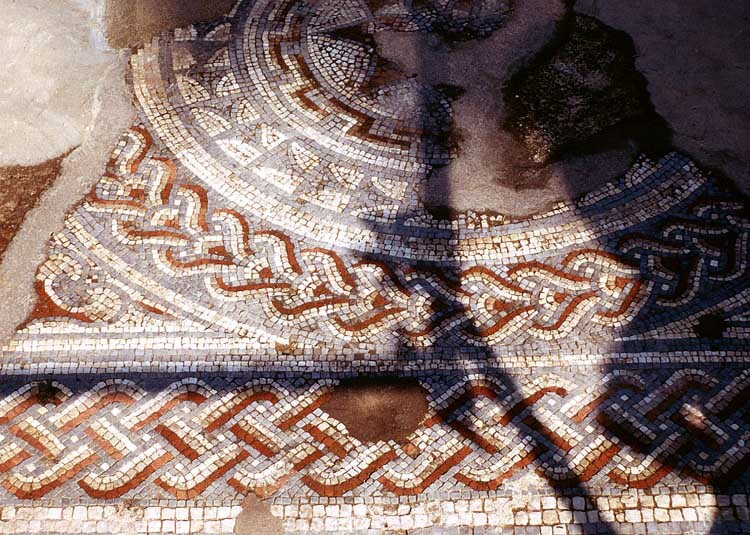 Part of The Great Pavement, a Roman mosaic dating from AD 325 at Woodchester, Gloucestershire, England. Knot-work patterns are most prominently related to Ireland; thus they are known as Celtic, being named after the Celts, the native people of Britain and Ireland. There are many samples of knot-work design in old Irish Bibles. 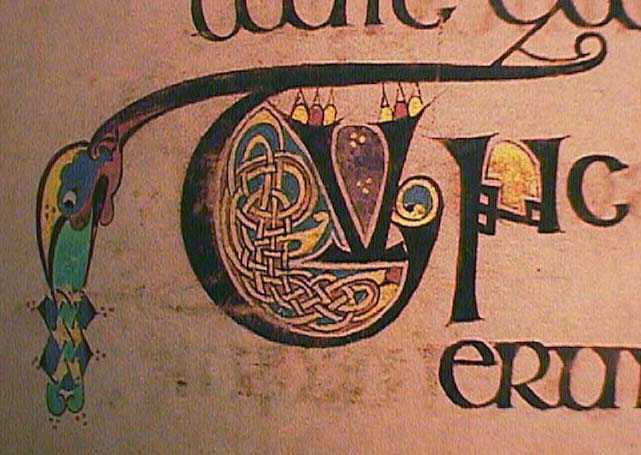 Irish monks illuminated their Bibles by embellishing the space around letters or in between passages with knot-work patterns. Illumination from "The Book of Kells"
While these interlacing patterns are intricate and beautiful, originally there were not specific meanings for specific knots. This is a more modern invention. That said, the most popular Celtic knot design, the “triquetra knot”, is modernly related to the symbolism of three. Because of this, it can be linked back again with the holy trinity of the Catholic church, making it perfect for a Saint Patrick’s day pendant. Celtic knots tend to be a popular motif year-round, not just for this holiday. Traditionally, Celtic knot patterns consist of one continuous band that has no termination point. People link this to unity. 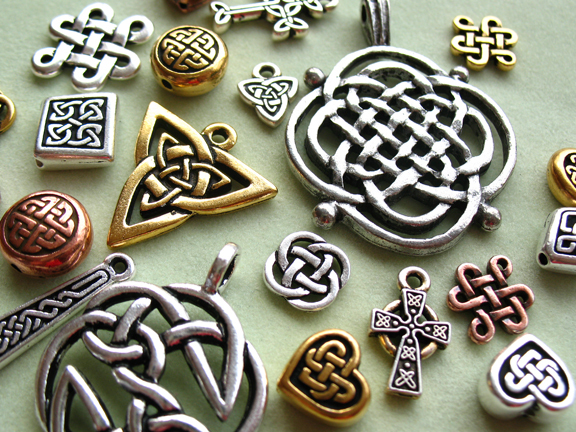 Celtic knots are also a good way to show any Celtic heritage you may have, whether it be Irish, Scottish, or English. With so many beads and pendants to choose from, it isn’t difficult to find a way to display Celtic Pride! As an interesting side note, interlacing patterns are also found in Islamic, Ethiopian, and Russian art.